​If you live with a cat that has arthritic symptoms of any sort, you know how sad it can be to watch them struggle to do the simplest things. Walking up stairs, walking to the food bowl, and even more importantly, walking to the litter box. Unfortunately, most cats that have arthritis aren't catered to properly and ​stepping into a regular litter box where the ​walls stand 4"or taller can be painful for them. Because of this, they'll usually bypass the litter box completely and go to the bathroom wherever they're comfortable. ​If you're dealing with something like this right now, we're glad ​you're here. We'​ve done a painstaking amount of research to find the best litter box for arthritic cats. 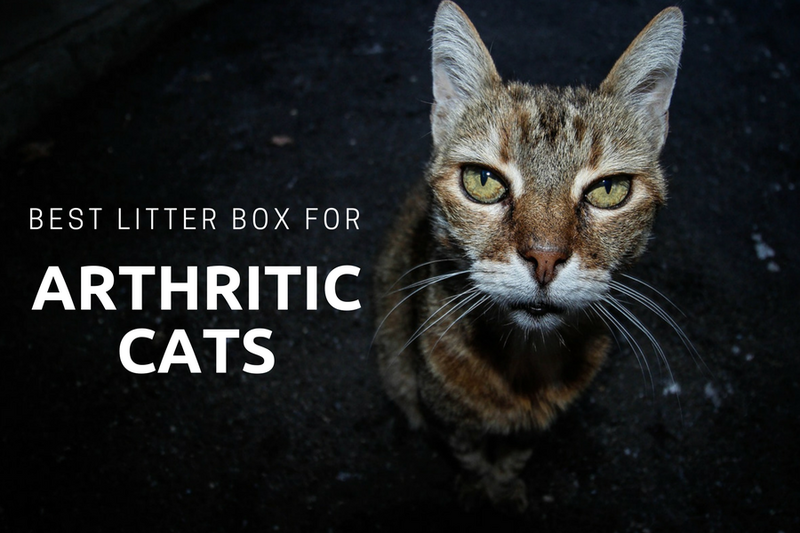 ​Finding the right litter box for an arthritic cat seems like it should be an easy process, but surprisingly there aren't a whole lot of options out there even though this is a relatively common issue. When faced with this situation, we feel the absolute most important features are that the litter box has at least one ​wall that's lower than the others, and it still manages to keep the litter in the box. To ​decide the best ​litter box for arthritic cats, we spent ​​8 hours combing the internet ​to find all of the different options out there. ​The main focus of our research was to find a litter box that had a lower ​wall to accommodate the cat, but also had a way of keeping the litter inside the box so that you don't spend all of your time cleaning ​up. Our multiple hours of research indicate that the best solution is the Dog Litter Pan by PuppyGoHere Indoor Training System. Now, we get it​. 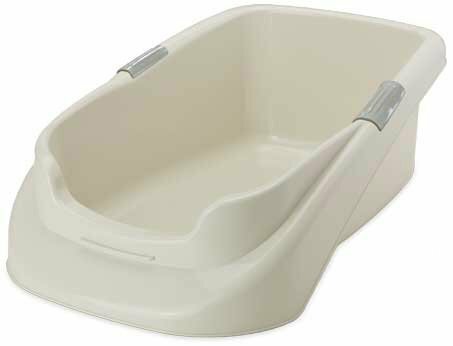 The fact that this is called the "Dog Litter Pan" is probably off-putting, but we feel like that is just ​bad marketing by the manufacturer. ​Compared to other options, this ​litter box is the one that gives the best value while ​delivering a quality product. Who is This ​Litter Box For? ​A significant amount of research went into creating the guide you're reading right now. In total, we spent 8 hours just to find all of the different options of litter boxes for ​arthritic cats. ​​Once the research was done, we spent 3 hours writing this guide to make sure we've answered every question you have and even those you didn't know you should ask. ​​​Low ​​​Wall of Box: ​We believe that the most important factor of any of these litter boxes is that they have one ​wall of the box lower than the others. This makes it so that​ the cat can easily enter the box without having any pain due to their arthritis issues. ​Does Litter Stay in Box: ​This was a tough one because with the lower ​wall of the litter box,​​ some litter is going to spill out, it's inevitable. That said, we ​reviewed the boxes to figure out how they are ​coping with this problem and the steps they've taken to reduce ​the chance of this happening. Durability: ​​​​​As with any litter box, durability is always something that's important. Is it made of quality materials? Will these materials hold up with years of use? These are the questions we asked ourselves while reviewing the options. Price: ​​​​​From what we've found, litter boxes with one low ​wall generally cost more than a typical litter box. ​The reasoning behind this is that it's considered a specialty item. Knowing this, we tried to only pick options that we felt are affordable for most. ​These litter boxes are specifically for​ owners that have a cat (or cats) that are dealing with arthritis. These ​litter boxes can also work if you have a senior cat ​that's become lethargic over time and may have an undiagnosed arthritic condition. Although these could technically be used by any cat, we recommend that those who have a healthy cat forego this article and find other options because it'll ​likely save you some money. As mentioned in our intro to this guide, we spent 8 hours combing the internet to research and find the best options of litter boxes for arthritic cats. We ​researched ​litter box options on a number of websites including Amazon, Walmart, ​Target, and Ebay. ​The list we originally created had 17 different options of varying sizes/colors/materials. From there, we ​reduced that list down to our top 5 options based on what people ​need. At that point we ​examined the reviews of what people were saying, checked the specs of each of the ​litter boxes, reviewed hundreds of questions that were asked, and spent a significant amount of time making sure we picked the best ​options. When we do our reviews here on Cat Kingpin, we pride ourselves on really diving into the products to understand what people need and what products match those needs. Having an Arthritic cat is already challenging enough, don't waste your time​ trying to find the right litter box option. We've already done the work for you. ​The Dog Litter Pan by PuppyGoHere Indoor Training System​ ​is definitely our favorite choice when it comes to a litter box for cats that have arthritis. This particular litter box has quite a few customer reviews of cat owners that have used it for their aging cat and were extremely happy with the results. ​Most people ​stated that once they ​replace their traditional litter box with this one, the cat will stop going to the bathroom in the wrong places and​ seems much ​less stressed out. The product itself is made of industrial-strength plastic, it's just as large as a normal litter box (except for the low side), and if you look closely at the pictures you’ll see that the ​walls of the box face outward which is their best attempt at making it so that the cats litter stays in the box itself. In addition, the price of this litter box is​ reasonable to solve the problem that you have. ​The main complaint about this litter box is, ironically, that small dogs won’t use it. Again, we have no idea why the company only focuses on dogs as the target for this, but the brand really should market it for cats who are aging and have developed arthritis. ​The Nature's Miracle High-Sided Litter Box, can be considered the Cadillac of litter boxes for cats with arthritis. The best thing about this litter box is that three of the inner ​sides are 11 inches tall. However, the front ​side that the cat ​walks into drops all the way down to about 3 inches. So, this is the perfect litter box if you’re dealing with your cat digging ​to "do their business". There is still a chance of the litter spilling over the front of the litter box, but the other​ sides hold it in well. ​This litter box also has molded handles and was designed in a way that the front of the box acts like a spout. Because of this, it’s very easy to pour litter out of the box when you’re changing it. ​The cons of this one are that the price is pretty high for what it is. While the litter box is very effective, it's simply just molded plastic ​which comes at a premium price. Though the price isn’t extremely expensive, it’s still a little steep for a litter box. The litter box is also marketed as having non-stick material, but sometimes the “icky” stuff definitely does stick. Lastly, there isn't a specific liner that will fit within this box and this could be frustrating for some. ​The Lucky Champ Litter Pan is by far the most reasonably priced litter box in our lineup. Just like the other models, this litter box has a low entry point in the front and is great for cats who have ​issues with arthritis. Th​ough you can’t​ tell from the picture, the back wall is much higher than the front wall and this litter box is designed in a way that the walls​ slope higher as they move towards the back. One of the big positives of this litter box is that it's very large. Externally it measures 26” x 17” and then the actual litter containing area inside of that is 20” x 13”. Due to its large size and high walls, this litter box does a good job of keeping the litter inside the box itself. ​The biggest complaint about this litter box ​is the fact that the clips that hold the canopy in place ​end up breaking. You see, this particular litter box is actually two pieces. The bottom part is the base of the box and then the actual litter pan snaps into the base using the gray clips on the side. Some have found this to be an issue because those clips tend to break pretty easily when using the litter box. In addition to that, one other common issue is that because there is a base to this litter box, older cats tend to accidentally go to the bathroom on the base as opposed to within the box itself. As you can see from the picture, the base is right under the side of the litter pan at the entrance and that leaves room for accidents to happen. ​The PetFusion BetterBox LARGE Cat Litter Box ​didn’t make it to one of our recommended litter boxes, but it’s still very good. The box is made with nonstick material that seems to really work and the plastic itself that's used to create this box is very thick. The sides of the box are as tall as 8" and while this isn’t the highest sided box in our ​guide, tho​se sides are still higher than normal. Like all the other options here, there is of course a low side in the front of the litter box as well. Many people also like that this litter box is large and can easily accommodate larger cats. There are two main complaints with this l​itter box. First, it’s pricey as far as ​litter boxes go. ​Second, there are numerous reports of the nonstick coating not working after ​a few months of owning the box and even some instances where the nonstick coating is coming off of the box itself. Our final selection isn’t a litter box at all, but we thought it was a pretty interesting idea. The Kitty Box Ramp​ is a pretty cool concept because it will work with any regular ​wall height litter box that you already have. As you can see from the picture, it’s simply​ a little ramp that your cat can walk up in order to enter the litter box. This completely eliminates the pain that the cat will feel from their arthritis. It’s also made it with three different levels so that you can adjusted to fit the litter box that you already have. The biggest problem with this option is mainly the material. As you can see from the picture, it's simply made from cardboard. While this can hold small and some medium-sized cats, it’s far too flimsy for any larger cat. In addition to that, it’s a pretty pricey item considering you can buy a new litter box for about the same price. The care and maintenance of litter boxes made for cats who have arthritis is no different than caring for a traditional litter box. Scoop Often: The amount of times that you ​need to scoop waste out of the litter box itself is really going to depend on how many cats are using it. That said, ideally you should clean the litter box every single day as it will keep your cat enthusiastic about using it as opposed to feeling like it’s dirty and finding somewhere else to go to the bathroom. Deep Clean Every ​Few Weeks: ​You should do a deep clean of the litter box a few times a month. By deep clean,​ we're referring to changing out the litter completely, washing the box, and refilling it with new litter. This will keep the box from smelling bad and will also make sure that it stays hygienic for your cat. Don’t Overfill With Litter: This is especially important with these litter boxes. Because all of them tend to have one low ​wall, the litter itself can easily spill out if the cat sweeps the litter in the direction of the low ​wall. That said, one of the best ways to avoid this is to make sure that you don’t overfill the litter box which will help prevent this issue from happening. Our recommendation is to only put about 1 inch depth of litter into the box itself. If you clean every day and consistently refill, this should limit​ the amount of litter that gets spilled on the floor. Q: How are litter boxes for arthritic cats different than regular litter boxes? A: The biggest difference that you’ll notice between these litter boxes and a common every day litter box is the fact that there is one side of the box that’s shorter than the others. The reason for this is because usually cats that are arthritic, or have a disability, may not be comfortable with lifting their legs high enough to get into other litter boxes. This short side makes it a much more comfortable for them and increases the likelihood that they’ll use it to go to the bathroom. Q: What prevents cats from kicking litter out the shorter side of the litter box? A: In short, there is nothing that actually stops this. Unfortunately, this is a side effect of these types of litter boxes, but it’s much better to have to clean up a little litter as opposed to all of the accidents that your cat is going to have because a regular litter box is painful for them to use. Q: What kind of litter should I use? A: With each of these litter boxes, any type of litter that you prefer can be used. We personally recommend that you use something clumping, and we specifically like Wheatscoop because it’s also flushable. That said, any type of litter that you want to use is permitted. Q: How often should I clean these litter boxes? A: This really depends on the temperament of your cat. Some cats are okay with you cleaning their litter box once a week, and others want you to do it daily. Because are dealing with an arthritic or disabled cat, we highly recommend that you clean the litter box daily because a cleaner litter box usually means more usage. It will be harder for your cat to move around in the first place and keeping the litter box clean will encourage them to continue to use it. Q: Can I put a cover on these litter boxes? A: From the research that we’ve done, we weren’t able to find any litter boxes that provided a cover specifically for cats who are disabled or have arthritis. While we’re not sure exactly why this is, it does prevent you from using a cover on these litter boxes unless you create one yourself. Q: Do these litter boxes work for large cats that have arthritis? A: Yes, we do believe that all of these litter boxes can accommodate a large cat, but we do encourage you to look at the actual dimensions to determine which one would be best for yours. Q: Do these litter boxes come with a paper or plastic liner? A: At the time of this writing, none of these litter boxes come with a plastic or paper liner. However, we don’t know if any of them will add such a thing in the future. ​While it's easy to find a litter box, finding a litter box that will accommodate a cat who has arthritis is a completely different story. There aren't nearly as many options out there and the options that you have tend to be higher priced. ​Our analysis into all of the options has made us comfortable with recommending the Dog Litter Pan by PuppyGoHere Indoor Training System​​ over all others.